Book Description: We cannot solve global challenges unless women participate fully in efforts to find solutions. Female participation in the private sector is a crucial economic driver for societies worldwide. Economic security benefits every facet of a woman’s life, with positive effects on the health, education and vitality of families. Learn about women who are changing their societies for the better. 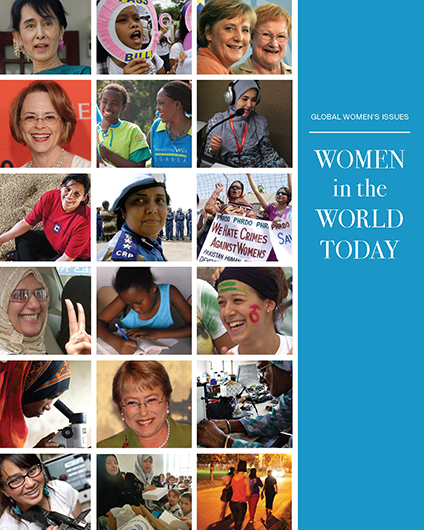 This extended version of Global Women’s Issues: Women in the World Today includes, for each chapter, a summary, key words, multiple choice questions, discussion questions, essay questions, and a list of additional resources. Global Women’s Issues: Women in the World Today is based on the twelve critical areas of concern identified in the Beijing Declaration and Platform for Action at the Fourth World Conference on Women in Beijing in 1995. This work (Global Women's Issues: Women in the World Today, extended version by Bureau of International Information Programs, United States Department of State) is free of known copyright restrictions. This book is in the public domain. To the extent possible under law, Bureau of International Information Programs, United States Department of State has waived all copyright and related or neighboring rights to Global Women’s Issues: Women in the World Today, except for the following additions, which are (c) 2017 Janni Aragon and Mariel Miller, and are licensed under a Creative Commons Attribution 4.0 International license. The following items were added to each chapter in this book: chapter summary, key words, multiple choice questions, discussion questions, essay questions, and a list of additional resources. This book was imported into Pressbooks and reformatted. Editable files now available.